Don't grow too fast, take it slow Baby! I'm so gna miss a lot of things like carrying him to sleep instead of rocking him. Luckily he's still breastfeeding at night so thats the only time we can stay close, cuddle and sleep together. 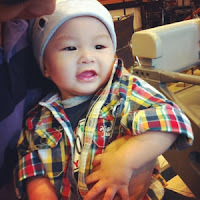 Having said that, I'm happy seeing him growing so well *Alhamdulillah!! * and excited to see his developmental milestones. His doctor's appointment is next week after Hari Raya public holidays. Can't wait to find out his weight! No doubt he's getting heavier day by day. We have to resort on stroller sometimes especially when he's sleepy. Btw, baby Iqbal can waves goodbye already! So cutteeee! At first it wasn't perfect but with a lot of practises, he finally got it right :D We're a proud parents! 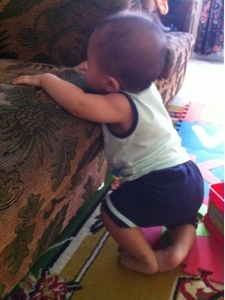 He can pull himself up to stand already too. Of course have to watch him EVERY TIME he tried to stand from sitting and otherwise. Even when he sits down from laying down also give me a heart attack sometimes! Hehe have to watch him really close now! It's the last day of Ramadhan today. Seems like it's a yearly tradition we had our last iftar at Ideal. Hows your preparation for Hari Raya tomorrow? Baby Iqbal is ready for his first Hari Raya :D and so are we!! !